WKJJ Trivia: WKJJ came into existence in early 1979. The AM frequency previously belonged to Top 40 station WKLO, while the FM frequency previously was beautiful-music formatted WCSN (and before that, WKLO-FM). The stations gained nationwide notoriety for their "lateral replay" concept. 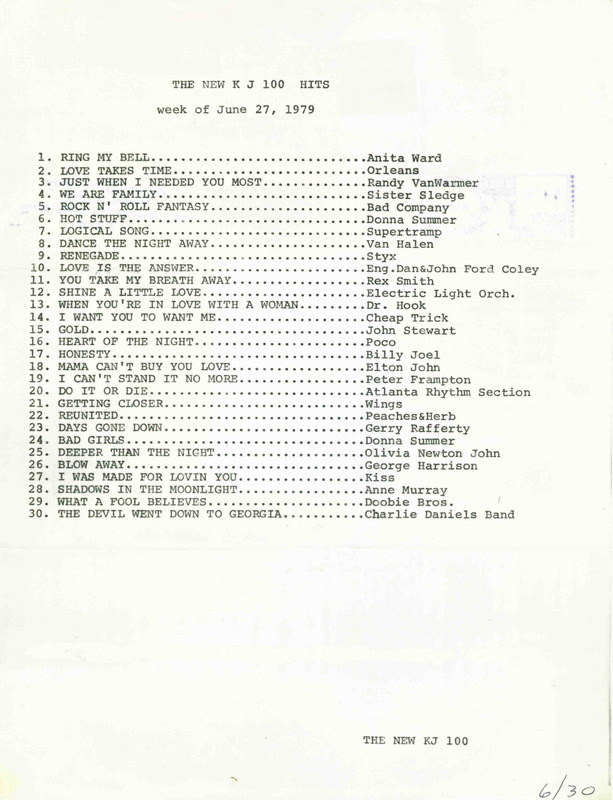 Songs on WKJJ-FM frequency were played eight minutes later on WKJJ-AM. FM listeners were invited to switch to the AM station if they wanted to hear the song again. The first songs played on WKJJ were "Renegade" by Styx, "Hot Blooded" by Foreigner, "What A Fool Believes" by the Doobie Brothers, "Blow Away" by George Harrison, "I'll Supply The Love" by Toto, "The Logical Song" by Supertramp, "Isn't She Lovely" by Stevie Wonder, and "Fire" by the Pointer Sisters. 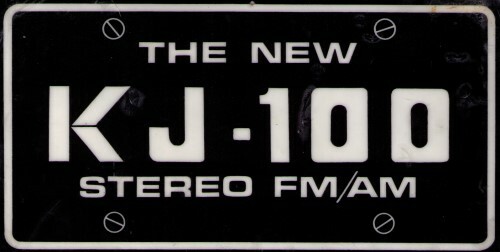 WKJJ-AM switched calls to WCII ("Country 11") with a country format in 1981. 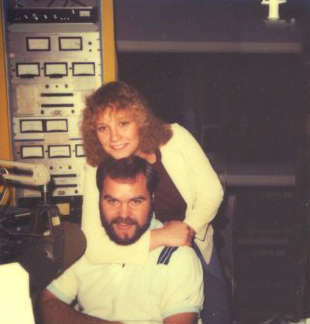 WKJJ-FM became WDJX in 1985. Know anything more about this station? Have any WKJJ airchecks, photos or promotional material? 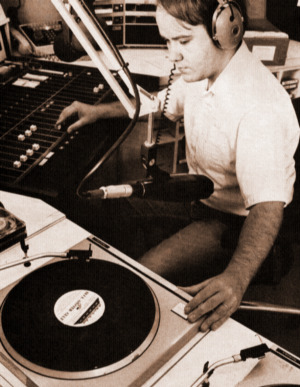 Rip Rinehart cues up a record for the photographer in the WKJJ-FM control room in 1981. It looks like a license plate, but it actually a WKJJ window decal. Rip Rinehart provides the description: "This aircheck is the last few minutes of WKLO-AM as a legal entity. 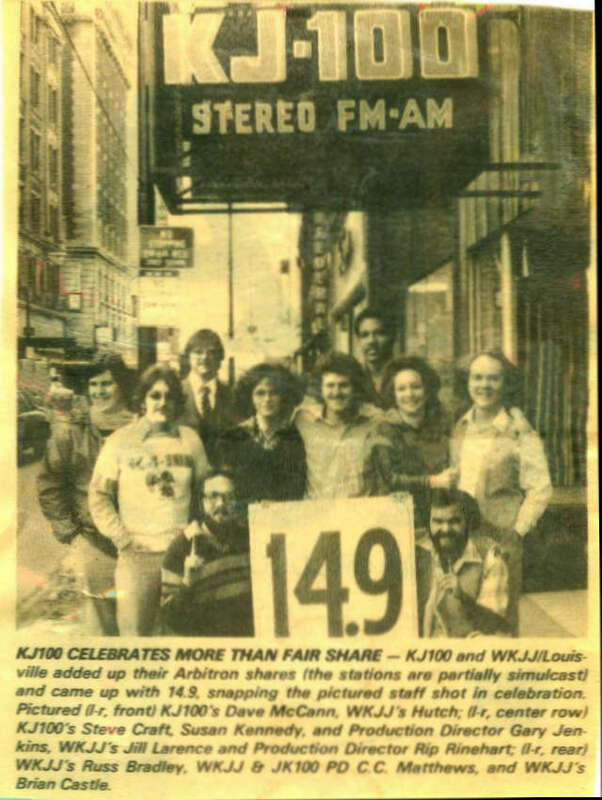 This would have been a few weeks after we started calling ourselves 'KJ-100' on both AM and FM, but still had to do legal IDs as 'WKLO-AM, WCSN-FM, Louisville.' As of midnight on whatever night this was, WKLO-AM officially became WKJJ-AM. The voice you hear is Horace Roth, the station's national accounts manager, who had been around approximately forever and whose raspy voice was quite distinctive, to say the least." Rip Rinehart explains: "This aircheck captures the last few minutes of the FM side's automated beautiful music format, including one of my smooth-as-Cheez-Whiz 'sunshine melodies of WCSN' drop-ins. (WCSN was the descendent of WKLO-FM.) A few more seconds of elevator music follows but then gets abruptly cut off by consultant E. Alvin Davis promising that 'if you loved the sunshine sounds we've been doing for years here, you're gonna be crazy about this. Welcome to JJ-100.' And then 'Renegade' by Styx. "I still remember the angry phone calls from WCSN fans who drifted off to sleep the night before to Percy Faith and Mantovani, only to be jarred awake the next day by Led Zeppelin and Foreigner. 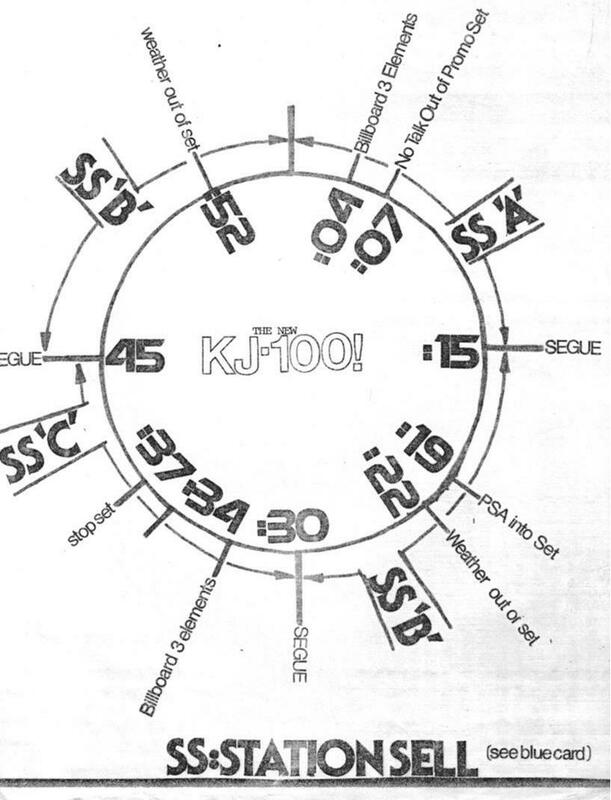 It's weird to hear E. Alvin refer to 'JJ-100' since shortly after that the decision was made to go with KJ-100 instead. " 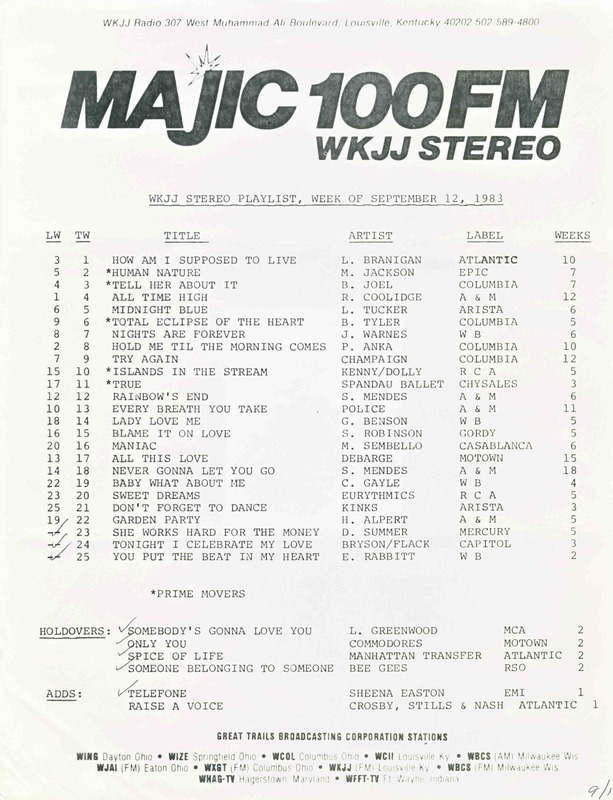 This was recorded the night before "Magic 100" became WDJX. Rip Rinehart recalls: "Everybody got together in the production studio and recorded these bits to run between songs on New Years Eve 1980. The idea was to make it sound like we were having a big party in the studio that night. Your host for the festivities is 'Dogman Jack' as played to perfection by Bob Cline. (Any similarity to Wolfman Jack is purely intentional!) Stepping up to do some 'material' are Hutch, Dave McCann, Bobby Hatfield, Woody Stiles, Bumper Morgan, Russ Bradley, Kevin O'Neil, and me." 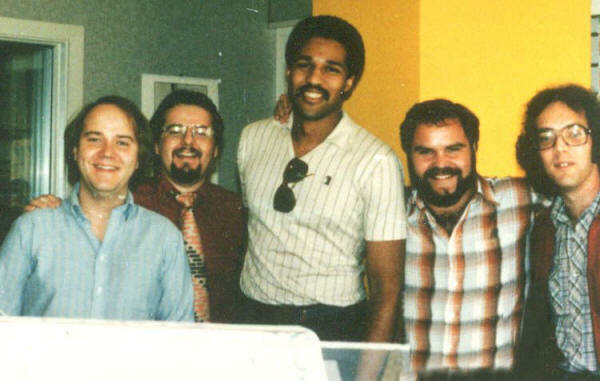 Rip Rinehart remembers: "As Production Director for KJ-100/WCII, I was called on to do lots of station promos over the years, and these are a few of my favorites. 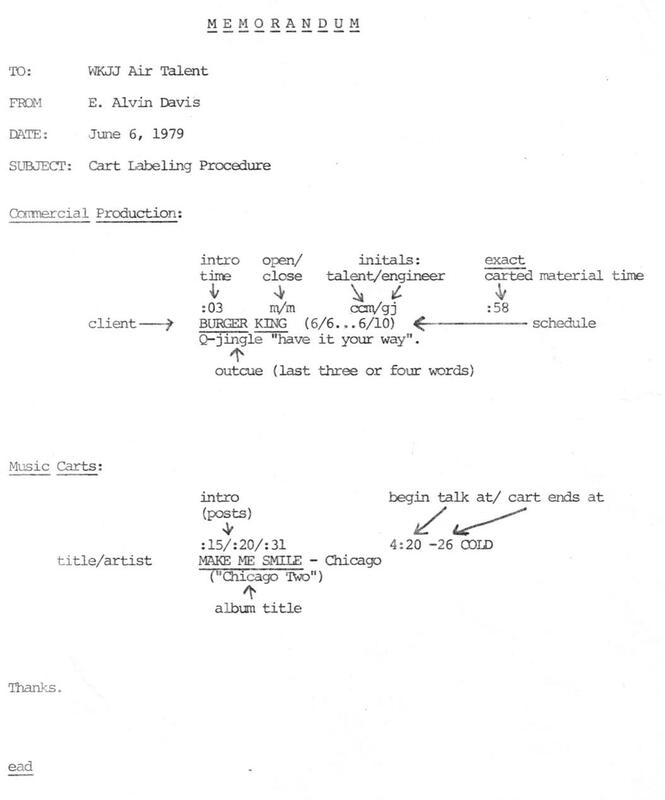 It starts with a Lateral Replays promo, explaining the concept of how we essentially skirted the FCC's non-duplication rules by replaying every song heard on the FM about seven minutes later on the AM. "That's followed by a few Saturday Night Special promos. Every Saturday at midnight, we'd play an hour of songs by an artist with lots of AOR credibility, such as Foreigner or Led Zeppelin, mainly to give the station a hip image. "Next are some fun Free Money promos featuring both winners and losers. You get to hear morning man Hutch, CC Matthews, and Dave McCann as they both giveth and taketh away...or at least refuse to giveth. "Then we have a Magic Bus promo. This was an occasional event where we'd pack a bunch of listeners on a bus and take them to a concert in a nearby city in case one of the big acts skipped l'il ol' Louisville. "The last promo is actually audio from a TV spot that we ran that featured some really cool animation, as I recall. I wish I had a copy of the video." Rip Rinehart says: "I guess this ran at the tail end of our Top Hits of the 70s special on New Years Eve 1979. I barely remember doing it, but thought it was kind of fun sounding, so I included it." All audio is in downloadable MP3 format.